Mashable defines gamification as "applying game thinking or even game mechanics into a non-game context. " Game mechanics in the "real world" include earning badges, completing missions and leveling up. 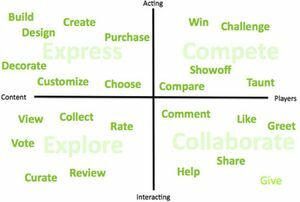 Non-game companies, like Amazon, Deloitte and Salesforce.com, gamify to increase customer engagement. 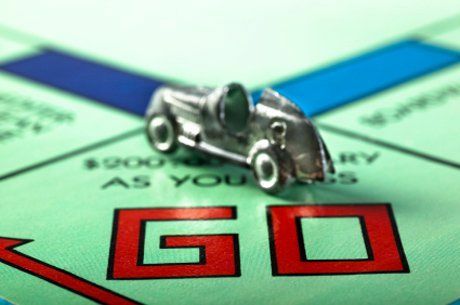 Gamification puts the customer on a journey motivated by intrinsic, or personally meaningful, rewards. An example is earning a "mayorship" badge on the mobile application Foursquare by "checking in" regularly to the same location. Gamification in the classroom has many benefits, too. After all, engaging a student intrinsically in the learning process, rather than with extrinsic motivators like grades, is the goal of every teacher. Awarding badges for academic accomplishments is a method to gamify the education. Global Kids, Inc. notes that badges "support learners to give language to and value what they are learning, by offering names for their new competencies and providing a venue that recognizes their importance." As a teacher, I assumed that game design had more to do with coding than the study of human behavior. 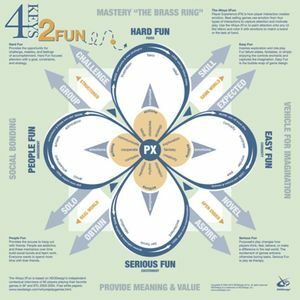 To truly understand gamification, I realized that I needed to understand the process of game design. In gaming terms, I decided to go on a quest. This model was originally intended for text-based multi-user dungeon (MUD) games that were popular in the 1990s (think Ultima II or Zork). MUDs predate multi-player online games with 3D graphics (like World of Warcraft). Much to Bartle's amusement, his model has been used as a template for non-game environments, like website design and social media platforms. Amy Jo Kim, Ph.D. is a leading consultant on gamification as a business model to increase customer engagement. She also holds a Ph.D. in behavioral psychology. In 2010, Kim reworked Bartle's Player Types Model. She replaced the "Killer" type with "Express" -- a much more business- and school-friendly descriptor! Completing the axis, "Compete" took the place of "Achiever," "Explore" replaced "Explorer," and "Collaborate" replaced "Cooperate." 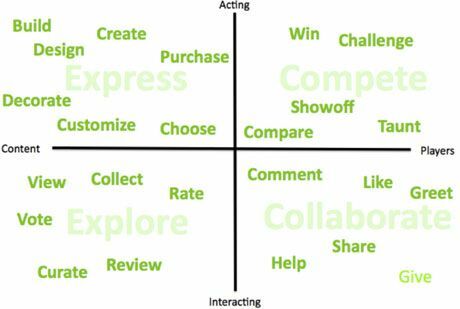 Teachers, like game designers, can gamify by choosing a quadrant and then creating goals and objectives using Kim's Social Engagement Verbs. Credit: Amy Jo Kim, Ph.D. The psychological concept of "flow" is prevalent in game design. Dr. Mihaly Csikszentmihalyi, a pioneer in the field, defines flow as "the creative moment when a person is completely involved in an activity for its own sake." Csikszentmihalyi created a model, known as the "flow channel," to describe the environment where skill and difficulty increase just enough to ensure that an experience is neither frustrating nor boring. Examples of integrating flow into the classroom setting include allowing students to choose how they learn, providing hands-on challenges, and setting goals. In addition to achieving flow, game players also seek to have fun. Dr. Kim observes that Bartle's Player Types Model has continual merit because "different people enjoy different types of fun." Fun, as it turns out, is serious business! In fact, the game publisher Valve (Portal, Half Life 2) employs a full-time experimental psychologist to measure players' physiological responses to game play. ClassBadges is a website that enables teachers to award badges. For more on successful badge implementation, read "Six Ways to Look at Badging Systems Designed for Learning," a collaborative study initiated by Barry Joseph of Global Kids, Inc. In order to successfully gamify in the classroom, it is therefore important to think like a game designer. In the book Reality Is Broken, Jane McGonigal observes that "players begin each game by tackling the obstacle of not knowing what to do and not knowing how to play." In other words, players are encouraged to learn as they go. This is the heart of student-centered learning. My quest led me to the very definition of constructivism!